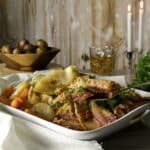 Corned beef brisket is cooked low and slow in a Guinness flavored broth until meltingly tender, coated with a brown sugar mustard glaze & served with cabbage, carrots, & parsley buttered potatoes. Put the onion wedges in the bowl of a slow cooker and lay the corned beef brisket on top. Sprinkle 2 tablespoons of the brown sugar over the brisket, toss in the bay leaves, and pour in the Guinness. Fill the pot with enough water to just cover the brisket. Cook the brisket on high for 4 hours or on low for 6 hours. Remove any tough outer leaves from the cabbage and slice it in half. Slice each half into two pieces and remove the core. Then, slice each quarter in half so that you have 8 wedges of cabbage. Nestle the cabbage into the slow cooker along with the carrots. Sprinkle in about 1 teaspoon of salt. Cook for another 2 hours on high or 4 hours on low. Preheat the oven broiler and place a rack in the center of your oven. In a small bowl, mix the dijon mustard with the remaining tablespoon of brown sugar and 1/2 tsp of salt. When the corned beef is so tender it pulls apart easily with a fork, remove it to an oven safe baking sheet. Spread the dijon mustard over the top of the brisket. Put the brisket in the oven and let broil for 2-3 minutes, just until the mustard begins to brown in a few places. Remove from the oven and place on a serving platter along with the carrots and cabbage. Sprinkle the corned beef brisket with chopped fresh parsley. Serve with Parsley Buttered Potatoes. Fill a large saucepan about 2/3 full of water and sprinkle in about 1 tablespoon of salt. Set the pan over high heat and bring to a boil. Add the potatoes and let them cook until just barely fork tender – about 5-8 minutes. Drain. Add the butter and oil to a large skillet and set it over medium heat. When the butter has melted, add the potatoes. Sprinkle the potatoes with a generous measure of salt and roll them around in the pan so that they are coated on all sides in butter and oil. Cover the pan with a lid or sheet of aluminum foil, turn the heat down to medium-low, and let cook for 10 minutes. Lift the lid and turn the potatoes over. Cover the pan again and let cook for another 10-15 minutes, until a fork pricked into one of the potatoes slides in like butter. Remove the pan from the heat and add the chopped parsley. Stir the potatoes around in the pan to coat in the butter and parsley, then turn them out into a serving bowl.